NL-500C™ is luxurious but economical fragranced hand soap in pearlized liquid form, pH 5 -7 neutral in nature. Carefully balance with skin emollient and Fruity Apple fragrance in Pink color, contains no non-aqueous solvent or cationic detergent. 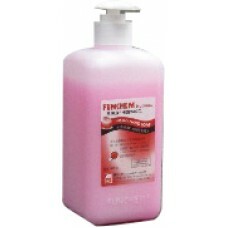 Foam rich and moderate viscosity (2500-3500 cPs) commercial pack in 500ml bottle. Leaving your skin soft and refreshing. Germicidal kills germ as it cleans. Each drop of liquid soap ensures 100% hygienic; prevent risk of slip when stepping on ordinary soap made up in cakes. NL-500C™ with convenient regulated dispensing pump head are welcomed in Restaurant, Public Bathroom, Toilets, Hospital, Clinic, Recreation Area, Theatre, Shopping Mall, Hotel, Office, Workshop, Factory, Schools, Nursery, Kindergartens and Food Process Plants…etc.